This script allows you to add “feature conditions” to any objects that hold features. These conditions are used to control whether the features from an object are applied to your actor or not. For example, suppose you have shield equips that have special elemental immunities when the “guard” state is applied. You can add these features to the shield and then use feature conditions to indicate that the “guard” state must be applied before the features are transferred. Feature conditions can be applied at the object level, which means all conditions must be met for any features to be applied. 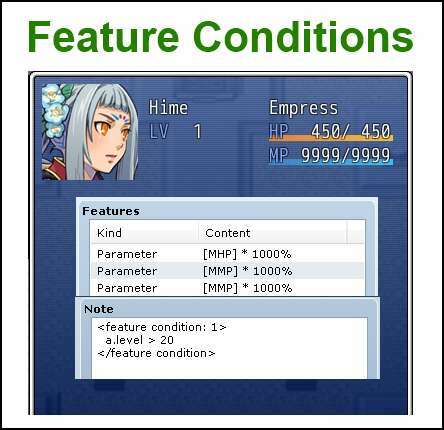 Feature conditions can also be applied at the feature level, which provides finer control over when specific features can be applied. the Feature Manager, then it will be applied to skills and items as well. the subject. If the actor has the state, then that actor is the subject. Be careful when writing your formulas. next one has ID 2, and so on. You can specify multiple ID’s by separating them with commas. Features are accessed during actor initialization. This means that if your condition references an actor, it will be thrown into a recursive loop and your game will crash. That seems like a method that is simply looking to see if the actor CAN equip a certain type of weapon, not if they actually ARE equipped with a weapon of that type, based on the description of the method in Game_BattlerBase. What would be the proper syntax to look for a specific gear type (weapon or armor) and check is item(s) of those types are actually equipped on the actor? i am a noob at ruby so this may be a silly question but how can i use in game variable as the condtion? Hi Hime. I know your script evals the conditions for the features. I created a simple snippet to check if someone is in the battle party (and also alive). Obviously I had to create a snippet for that (it just wouldn’t fit the notebox). The check itself works fine, I put it under Game_Interpreter. But when the game runs, I get a NoMethod error. If I don’t add the feature condition and call it from the script call, the script does run. I know it’s because the snippet I made is out of scope, that’s why the NoMethod error, but how can I fix it? Sorry for the extra long post, I don’t even know if that’s the right place for it. You should be able to put it in the note-box, even if you put it on multiple lines. Formulas are executed in the context of the feature, which is kind of useless. Now you can define the method for both Game_Actor and Game_Enemy and you suddenly have a feature condition that works for both actors and enemies. First, thanks for the quick reply! I tried putting it in Game_Battler (or even Game_Actor) and I got a Stack level too deep error. but it doesnt work as I think it ought to. Instead, as soon as you get 1 mana, you get all features. I want to make it so that the more mana (1,2,3 etc) you currently have, the more features you get. Any help? Checking for equality is ==, not =. See if using == solves the problem. It is weird too, when I reverse it (mp==3,==2,==1) it results in something else. I think, I will make permstates, each seperate with its own Feature Condition. Clean fix without causing too much issue, lol. Thanks for the response. Question: how do i get a specific feature to show up if the actor/class has a certain ‘weapon type’ equipped? I don’t mean specific weapons, i mean like swords, axes, guns, bows, staves, etc. Sorry about bothering you yet again, but i have a question. How should i make switch conditions? Thanks! Nevermind, i think i got it. Which refers to switch 1.
awesome script! Makes a lot of duplicating redundant and as such is always welcome! A little contradiction to your writeup, what I found in my project: When tagging multiple features in the way you described (feature condition: x, y, z, …), in my case with a state, it doesn&apos;t work and always applies the latest set of features on the state. lHowever, when I tag the features alone feature per feature (feature condition: x, then another tag with feature condition: y, etc) it works just fine. Of course, could be a minor compatibility issue since I didn&apos;t test it on an empty project, but I just thought I&apos;d mention it. Thanks for the sweet script in any case! Oops, you&apos;re right, I wrote it down because I was going to implement it, but I guess I only implemented it in my thoughts. I&apos;ve updated it so that it actually parses multiple ID&apos;s.
This is a pretty sick function actually. The amount of possibility this brings to the game is immense. I will begin testing it shortly. Thanks!